The Board of Trustees for the Ferguson Municipal Public Library District has decided to put Proposition L, a measure affecting the property taxes that fund the library, on the ballot for the April 3, 2018 election. The Board has wrestled with a growing sense of need for stable funding for some time. The last time the library had a tax increase was 23 years ago, because the Board does not do this sort of thing lightly. The library’s tax revenues have dropped significantly since 2010. 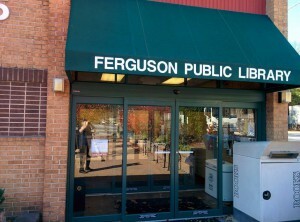 Shall there be a tax increase of $0.18 over the present tax rate ceiling of $0.22 per one hundred dollars assessed valuation for the Ferguson Municipal Public Library District? A Ferguson homeowner with a house worth $50,000 on the open market can expect to see their tax bill go up by about $17. A Ferguson homeowner with a house worth $100,000 can expect to see their tax bill go up by about $34. For much more detail, please go to http://ferguson.lib.mo.us and click on “Prop L”. We would like to cordially invite you to our open house! 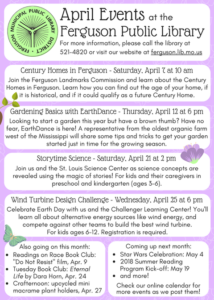 The Ferguson Municipal Public Library has seen many changes over the last few years. Reconnect with your hometown library and stop by on Monday, September 25 for some light refreshments and to hear about some of the work we are doing. Library Director Scott Bonner will give some brief remarks at 5:30. See you there! 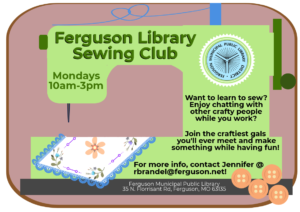 A Public Hearing will be held at 7:00 p.m. on Monday, September 25, 2017, at the Ferguson Municipal Public Library District, 35 N. Florissant Road, at which citizens may be heard on the property tax rates proposed by the Ferguson Municipal Public Library District, a political subdivision. The tax rates shall be set to produce the revenue that will be budgeted for the fiscal year beginning July 1, 2016. The rates allowed under the existing tax rate ceiling are at or below the $0.2200 authorized by Ferguson voters. The Library District may make adjustments pursuant to Missouri Revised Statutes Section 137.073, and as required by Law, in accordance with Article X, Section 22 of the Missouri State Constitution. Please see the attached file for more information.